Ganzfeld Experiments Ganzfeld is a German word meaning 'complete field'. The Ganzfeld experiments were originated by the German psychologist Wolfgang Metzger (1899 - 1979), and are considered to have been the most carefully scrutinised ESP experiments. Alleged psychics had their eyes covered and ears blocked while a 'sender' attempted to transmit messages to them. Later the psychics would compare the messages received with those sent out. There was a great deal of excitement and interest at the time but the research failed to produce any convincing results. Gardnerian Wicca Gerald Gardner claimed to have been initiated into a secret witch cult which had been in existence for over 300 years. Hence Wicca is often referred to as The Old Religion, with its own rituals and beliefs, most of them remaining secretive. Gerald Gardner's books Witchcraft Today and The Meaning of Witchcraft became the basis for the modern religion of Wicca, which grew in popularity during the 1960's, and spread quickly from the United Kingdom to the rest of Europe as well as the United States of America, Canada, Asia and Australia. It has continued to grow as a religion, its followers now placing a greater emphasis on a reverence for nature, redeveloping the 'Goddess-worshiping' religion from pre-Christian and non-Christian religions, and group magick aimed at healing. Geburah Geburah is the fifth Sphere (Sephirah) of divine emanation according to Kabbalah. The word Geburah means severity. See also Sephiroth. Gehinnom Basically, what we refer to as Hell. The place of spiritual punishment and/or purification for the wicked dead in Judaism is not referred to as Hell, but as Gehinnom or She'ol. According to most sources, the period of punishment or purification is limited to 12 months, after which the soul ascends to Olam Ha-Ba or is destroyed (if it is utterly wicked). Gematria Kabbalists believed that the written word of God was the result of His inspiration and that Scripture contained within itself an essence of His being. By the same token they believed that since God is hidden, so too, was there a hidden meaning beneath the divine words of Scripture. Gematria made use of the fact that every Hebrew letter has a numerical value assigned to it, so any words with the same numerical value could be linked. For anyone interested in studying Gematria, Aleister Crowley's 'numerical dictionary' Liber 500 Sepher Sephiroth is essential reading. See also Isopsephy. Gemini Gemini, the Twins, is an air sign and the third sign of the zodiac. Gemini is ruled by the planet Mercury. Genie A genie is a member of a race of powerful and magical invisible beings created out of smokeless fire who can use their powers for good or evil. See also Jinn. Geomancy Geomancy is a method of divination which involves reading features of the environment, such as the skyline, the lie of the land, the layout of a room, markings on the ground, or how handfuls of dirt land when someone tosses them. The art of Feng Shui uses practices similar to those used in geomancy, although it is not classed as geomancy, which once formed part of the required study of the Hermetic Order of the Golden Dawn in the late nineteenth century, and which still survives in modern occult practice. Gilgul Describes a Kabbalistic concept of reincarnation. In Hebrew, the word gilgul means "cycle" or "wheel" and neshamot is the plural for "souls”. Souls are seen to "cycle" through "lives" or "incarnations", being attached to different human bodies over time. Gimel The third letter of the Sacred Alphabet. It literally means camel, has the phonetic value of G, and has a numerical value of 3. It is further attributed to the Moon and the Tarot Trump The High Priestess. Glyph A glyph is a symbol, icon, pictograph, etc., used as a graphic representation of something. Glyphs are often used for secondary communication devices such as signs and instructional devices. See also mandala. Gnomes In Alchemical tradition, these are the elemental spirits of Earth. Gnosis This word derives from the Greek word for knowledge. It refers to the divine knowledge sought by Gnostic initiates, who, contrary to the Christian view that salvation could be achieved at death, believed it could actually be obtained in life. The related word Agnosis, meaning ignorance, is the root of the modern term agnostic. 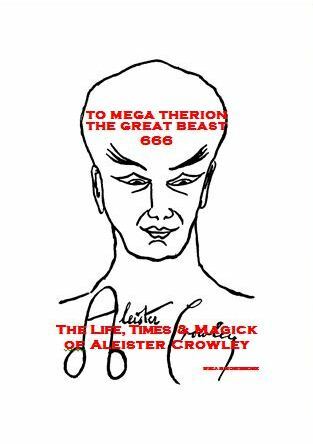 Gnostic Mass Aleister Crowley wrote Liber XV - The Gnostic Mass in 1913 while travelling in Moscow. It is similar in structure to the Mass of the Roman Catholic Church in many ways, but the similarity ends there as the Gnostic Mass is a celebration of the principles of Thelema, requiring five officers, namely a priest, a priestess, a deacon, and two acolytes (called children). Gnosticism This was an early form of Christian heresy, and a related Pagan faith that believed the creation of matter was flawed, and the Creator, therefore, was an evil force. In Gnosticism, Jesus is equated to the serpent in the Garden of Eden, and one of the Archons. Goat of Mendes See Baphomet. Goetia Goetia is the first part of the Lemegeton, or Lesser Key of Solomon, a 5-part seventeenth century manual on demonic invocation popular with nineteenth/twentieth century occultists, most notably Aleister Crowley and Arthur Edward Waite. The word Goetia stems from the Greek, meaning sorcery. The Lemegeton purports to be the magical manual of King Solomon, whose legend includes tales of servant demons conjured by him to do his bidding. Graphology Graphology, a form of divination, is the study of handwriting which claims to show the writer's character. In recent years graphology has been used by white-collar companies to select the 'best' workers from job applicants. Great Work This term originates from the Latin of the Alchemists and relates to the completion of the alchemical process, the Summum Bonum. In Ceremonial/Ritual Magick, the phrase refers to the ultimate goal, i.e. union with the Divine. In Thelemic practice, it means succeeding in gaining the knowledge of and conversation with one's Holy Guardian Angel. Grim Reaper The anthropomorphism of Death, normally as a skeleton carrying a scythe, who exists in mythology and popular culture. The actual reality of death has had a tremendous influence on the human psyche throughout time, which explains why the personification of 'Death' as a living entity has existed in most societies since history began. Grimoire A book containing a magician's spells or incantations, or a system of magick. Many such books were produced during the Middle Ages and Renaissance period. The Lemegeton, or Lesser Key of Solomon, is a grimoire, translated by Samuel Liddell Macgregor Mathers and edited by Aleister Crowley. Grounding Dispersing any excess energy generated during a magical rite by sending it into the earth. Guardian Angel A guardian angel is a supernatural creature or spirit who is believed to protect and guide a particular person. Orthodox religions believe that certain angels are appointed by God at baptism to guide and protect each of the faithful. See also Aleister Crowley’s Liber VIII – How to Contact your Guardian Angel.